Just who is tracking you as you surf the web? As privacy online becomes the big focus for web users, Firefox browser creator Mozilla released a new privacy add-on for Firefox called Lightbeam at the back-end of 2014. As more and more people become aware and concerned by how their online activities are tracked for commercial purposes so the number of browser add-ons to block third party tracking proliferate. It does this by producing a real-time visualisation charting every site a user visits, and every third-party that operates on those sites that could be collecting and sharing user data. Whilst Mozilla is keen to stress that cookies in themselves aren’t bad: it’s just that internet users should be aware of who they’re being used by, and for what purposes. We skipped around the web for 20 minutes this morning and as you can see from the chart below, after visiting 20 websites we also had connections with 58 third party sites! 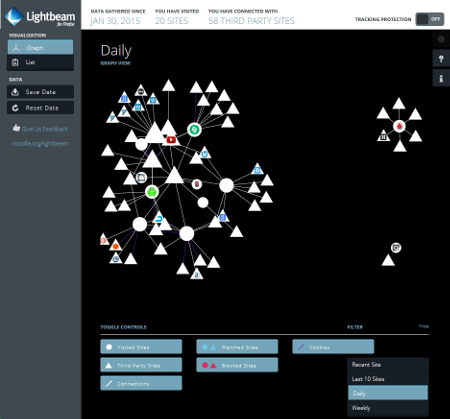 As well as the chart view you can also see a detailed list of all your connections and you can also save your unique connections to the Lightbeam database Mozilla are building to encourage users to visualize the state of tracking as an aggregate and to examine relationships that exist on the Web. Grab the add-on here and start tracking the trackers!